For other people named Bryan Fletcher, see Bryan Fletcher (disambiguation). 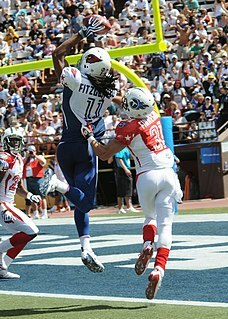 Bryan Jamaile Fletcher (born March 23, 1979) is a former American football tight end. He played college football for UCLA, and was drafted in the 6th round of the 2002 NFL Draft by the Chicago Bears. Flecther won Super Bowl XLI with the Indianapolis Colts over the Bears. In the three years with the Colts, he had 54 catches for 547 yards and 5 touchdowns. After the 2008 NFL Draft he was waived by the Colts. He is the younger brother of former San Diego Chargers running back Terrell Fletcher. Reginald Wayne is a former American football wide receiver who spent his entire 14-year career with the Indianapolis Colts. He played college football for the University of Miami, and was drafted by the Colts in the first round of the 2001 NFL Draft. A six-time Pro Bowl selection, Wayne was a member of the Colts' Super Bowl XLI championship team that beat the Chicago Bears. He ranks seventh all-time in NFL career receptions, tenth all-time in NFL receiving yards, and 23rd all-time in career touchdown receptions. On December 14, 2014, Wayne played in both his 209th game and his 142nd win as a member of the Colts, breaking the franchise records set by Peyton Manning. Dallas Dean Clark is a former American football tight end who played 11 seasons in the National Football League (NFL). He played college football for the University of Iowa, earned unanimous All-American honors, and was recognized as the top college tight end in the nation. He was drafted by the Indianapolis Colts in the first round of the 2003 NFL Draft and he was a member of their Super Bowl XLI championship team against the Chicago Bears. He also played for the Tampa Bay Buccaneers and the Baltimore Ravens. Richard Scott Proehl is a former American football wide receiver in the National Football League. Proehl played 17 seasons with the Phoenix/Arizona Cardinals, Seattle Seahawks, Chicago Bears, St. Louis Rams, Carolina Panthers, and Indianapolis Colts. He played in four Super Bowls and won two: Super Bowl XXXIV with the Rams and Super Bowl XLI with the Colts. Devery Vaughn Henderson Jr. is a former American football wide receiver who spent 9 seasons with the New Orleans Saints of the National Football League (NFL). The Louisiana-born Henderson played for Louisiana State University (LSU) where he and the Tigers won the 2004 BCS National Championship Game for the 2003 NCAA Division I-A football season. A few months later, the New Orleans Saints selected Henderson in the second round of the 2004 NFL Draft. Bryan Heath Evans is a former American football fullback and former analyst on NFL Network. 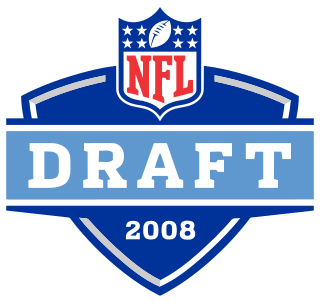 After playing college football at Auburn he was drafted by the Seattle Seahawks in the third round of the 2001 NFL Draft. He also played for the Miami Dolphins, New England Patriots, and New Orleans Saints, the last of which he won a Super Bowl with while on injured reserve. Evans retired after the 2010 season and was formerly an analyst with NFL Network. Brandon Michael Williams is a former American football wide receiver who last played for the Pittsburgh Steelers of the National Football League. He was drafted by the San Francisco 49ers in the third round of the 2006 NFL Draft. He played college football at Wisconsin. Gbolahan Devin Aromashodu is a former American football wide receiver. He was drafted by the Miami Dolphins in the seventh round of the 2006 NFL Draft. He played college football at Auburn. Jacob Francis Tamme is a former American football tight end. He played college football at Kentucky and was drafted by the Indianapolis Colts in the fourth round of the 2008 NFL Draft. Jared Alan Cook is an American football tight end who is currently a free agent. He played college football at the University of South Carolina and was drafted by the Tennessee Titans in the third round of the 2009 NFL Draft. He has also played for the St. Louis Rams and Green Bay Packers. William Brody Eldridge is a former American football tight end for the Indianapolis Colts, St. Louis Rams and Chicago Bears. He played college football at Oklahoma and high school football at Prairie View High School in La Cygne, Kansas. Eugene Marquis "T. Y." Hilton is an American football wide receiver for the Indianapolis Colts of the National Football League (NFL). He played college football at FIU, and was drafted by the Colts in the third round of the 2012 NFL Draft. Julius Dewayne Thomas is a former American football tight end. He played college football and basketball at Portland State, and was drafted by the Denver Broncos in the fourth round of the 2011 NFL Draft. He has also played for the Jacksonville Jaguars and Miami Dolphins. Dwayne Lamont Allen is an American football tight end for the Miami Dolphins of the National Football League (NFL). He played college football for Clemson University, earned consensus All-American honors, and was recognized as the most outstanding college tight end in 2011. He was selected by the Indianapolis Colts in the third round of the 2012 NFL Draft. With the New England Patriots, he won Super Bowl LIII over the Los Angeles Rams. Jacoby Fleener is an American football tight end who is currently a free agent. After playing at Joliet Catholic Academy during high school, Fleener played college football at Stanford University. He was drafted by the Indianapolis Colts in the second round of the 2012 NFL Draft. He has also played for the New Orleans Saints. Eric Ebron is an American football tight end for the Indianapolis Colts of the National Football League (NFL). He played college football at North Carolina, and was drafted by the Detroit Lions in the first round of the 2014 NFL Draft. Clive Walford is an American football tight end for the Miami Dolphins of the National Football League (NFL). He played college football for the University of Miami and was drafted by the Oakland Raiders in the third round of the 2015 NFL Draft. ↑ "Bryan Fletcher, TE - UCLA". Usatoday.Com. April 21, 2002. Retrieved November 4, 2011. ↑ "Bryan Fletcher Profile". Ind.scout.com. Retrieved November 4, 2011. ↑ "Bryan Fletcher, TE at". Nfl.com. Retrieved November 4, 2011.